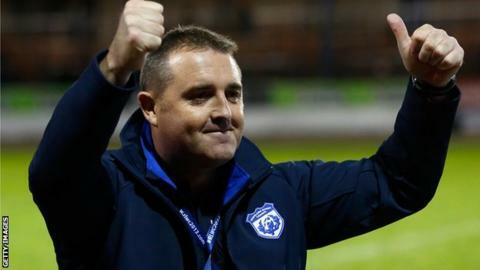 Scotland boss Steve McCormack has become head coach of Championship One club Gloucestershire All Golds until the end of the season. McCormack has been in charge of the national team since 2004, and has club experience with Salford, Whitehaven, Widnes, Barrow and Swinton. Brad Hepi stepped down as All Golds coach last week. "Since the World Cup I have been looking for an opportunity to get back into club coaching," said McCormack. "I can't wait to get back onto the training field. It is a unique opportunity to coach within the All Golds environment." McCormack led Scotland in his second Rugby League World Cup tournament in 2013, where they earned their best result in their history by reaching the quarter-final stages. Alongside his international and club commitments, he will continue to work as a lecturer at Warrington College. Gloucestershire All Golds joined the semi-professional Championship One for the first time last season and now currently eighth in the league in their second term.